← E. A. Edkins and some updates! So in honor of the Gentleman from my home state of Rhode Island, let’s take a look at the extremely important contribution to Hodgson’s legacy made by the company which also kept Lovecraft’s memory and work from dying in the pulps: Arkham House! Arkham House was started in 1939 by August Derleth and Donald Wandrei. Their initial purpose was to preserve the writings of their friend, H. P. Lovecraft in hardcover. From that beginning, Arkham House spread to become one of the leading publishers of weird fiction beginning the careers of such important writers as Ramsey Campbell and Brian Lumley. In addition, Arkham House brought classic writers to entirely new generations. One of those writers was William Hope Hodgson. 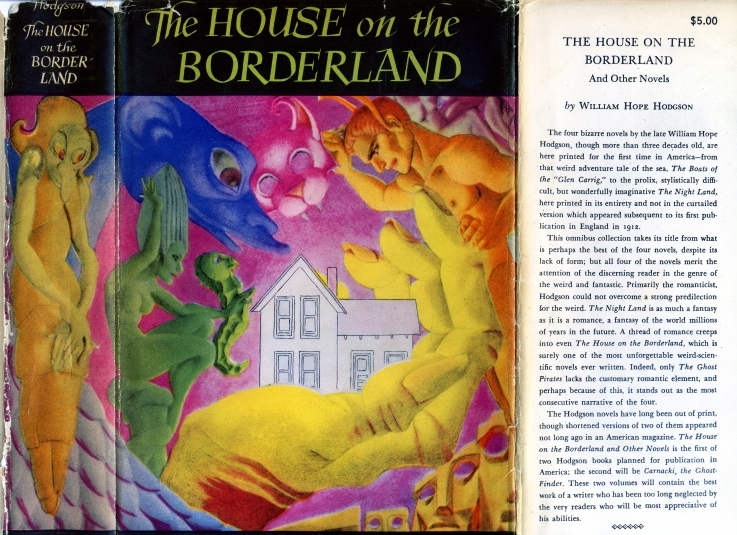 Throughout Arkham House’s history, they published three collections of Hodgson’s fiction (two through AH and one through their imprint, Mycroft & Moran). These volumes are now highly prized by collectors but their most significant achievements were simply keeping Hodgson’s work alive and available. This is arguably the most important book in Hodgson’s publishing history. After the series of cheap reprints by Holden & Hardingham in 1920-21, Hodgson was virtually forgotten. In fact, no books by Hodgson were reprinted at all between 1921 and this volume in 1946. Had H.C. Koenig not convinced both Lovecraft and August Derleth of the merit of Hodgson’s work, this book would never had appeared and Hodgson would only be a footnote in the history of weird fiction today. Because this collection appeared, the novels were kept alive to garner more fans and result in the paperback reprints by Ace in 1962 of HOUSE and NIGHT LAND. It would not be until 1971 that Ballantine would include BOATS as part of their Adult Fantasy paperback series and THE GHOST PIRATES would not be reprinted until the British edition from Sphere in 1975. This single book is the trigger for all that has followed since. 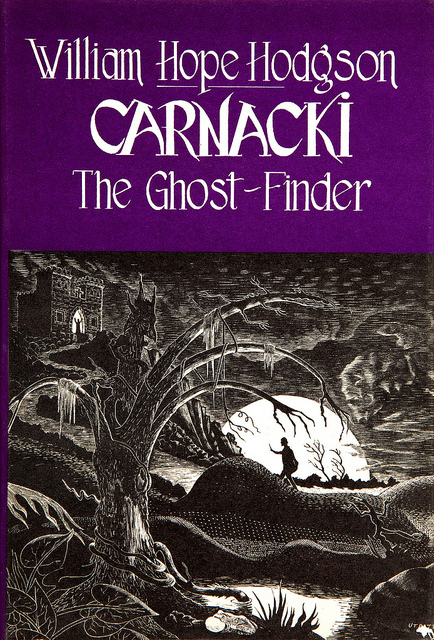 CARNACKI, THE GHOST-FINDER was only the 2nd book to be published by the Arkham House imprint, Mycroft & Moran. Developed to showcase mystery and detective fiction, M&M was named after two characters from the Sherlock Holmes mythos (Mycroft, Holmes’ brother, and Moran, who was the infamous Professor Moriarity’s second in command). The bulk of M&M’s output seems to be devoted to Derleth’s own Holmes pastiche, Solar Pons. The dust jacket on this volume was created by artist Frank Utpatel. Released in 1947 at 241 pages and priced at $3 with a print run of 3,050, this is the most important edition of Carnacki ever to be published. The reason for that is the fact that this edition contained three stories that had not been included in the previous Carnacki collections of 1913 or 1921. These three stories were acquired by Derleth through H. C. Koenig (who likely had gotten them originally from Hodgson’s family). The most powerful and popular Carnacki story, “The Hog”, was one of these three stories. This means that Lovecraft likely never read this story despite the fact that it echoes many of the themes and effects Lovecraft himself used in his fiction. Once again, had Arkham House not published those three ‘missing’ stories, it is entirely likely that they would have been lost. Only “The Haunted Jarvee” was published previously (in an issue of the EMPIRE MAGAZINE in 1929). If nothing else, Derleth and Arkham House deserve praise for rescuing “The Hog” from obscurity. Although not as collectible as HOUSE, the average price for this book on the used book market is between $100-$150. For most of these stories, this was their first reprint since their original magazine appearances which, in some cases, were 40 years previously! By collecting these stories together, not only was Derleth preserving their memory but also bringing them to an entirely new generation who were able to see that Hodgson was a master of the sea-horror story. 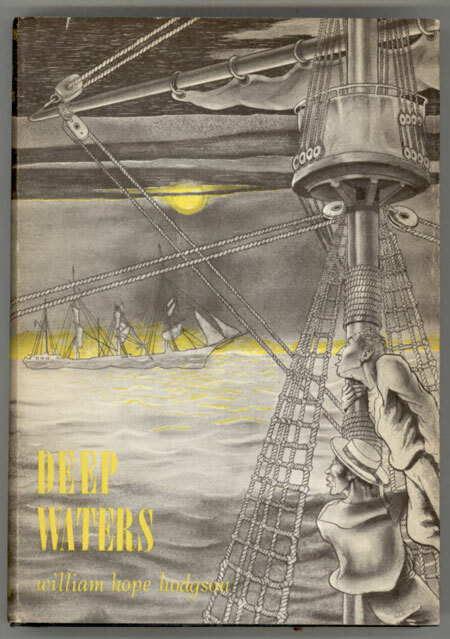 Although originally planned as early as the late 40s, DEEP WATERS did not appear until 1967. Possible reasons for this could have been Arkham House’s financial state (never particularly strong) or the amount of time it may have taken for the last two Hodgson books to sell out. This book can usually be found today for between $60-$100. I feel that it is safe to say that we owe Derleth and Arkham House a great debt as Hodgsonians. Without these three books, we probably would never be able to read Hodgson today. Remember also that these books were a direct result of constant encouragement by H. C. Koenig. These are all really pricey in good condition today. Indeed but if you are patient, you can find them for decent prices!